Do you enjoy growing your own herbs for homemade meals? If so, consider having garden windows installed by Windows Plus for your home in the Louisville, Kentucky, metropolitan area. Garden windows consists of a series of glass panes that encapsulate a shelf that protrudes from your home. They are popularly installed above a kitchen sink where small herbs and other plants can catch sunlight and be easily watered. Imagine being able to snip fresh rosemary or mint leaves from potted herbs that conveniently grow inside your kitchen! Windows Plus installs high-quality windows from a variety of manufacturers to give our customers in the Louisville, KY, area a range of choices. However, for the best thermal performance, we recommend our own Energy Wall line. Energy Wall garden windows contain multiple panes of insulated glass and other energy-efficient features to minimize heat transfer and potentially lower your monthly energy bills. At Windows Plus, our technicians are factory trained and specialize in window installations – they are not jacks-of-all-trades – and can therefore be trusted to install your garden windows flawlessly. We are a licensed, bonded, and insured company that backs all the products we install with a lifetime warranty. As such, we are a trustworthy source for impeccable garden window replacement services. Contact Windows Plus today to learn more about garden windows and how they can improve your enjoyment of your home. We proudly serve homeowners in Louisville and throughout the Kentuckiana area. Are You Ready for New Windows? Double hung windows provide a classic look but with more ventilation options than single hung windows, as both sashes can be slid vertically to open. Slide the top half down, the bottom half up, or slide both open! Sliding window sashes glide horizontally on tracks above and below the window. They’re easy to use while offering wide views of the outdoors. 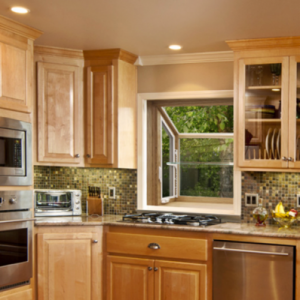 Casement windows open by turning a convenient crank-style handle. They can be fully opened, unlike some other window styles, allowing for full-length ventilation and an abundance of natural light. Awning windows are horizontally hinged and open with a crank-style handle. They can be combined with other window styles for added light and ventilation, or used alone for privacy or to fit small spaces. Like awning windows, hoppers are hinged horizontally, but across the bottom. Rather than opening outward, they swing in. Hoppers are great in small spaces or for pairing with other window styles for extra light and airflow. Picture windows are non-operational. They have slim frames to create a beautifully clear view of the outdoors. They are often paired with adjacent, operational windows on either side. Garden windows protrude from the home, creating the perfect place for displaying potted plants, growing herbs, or hanging sun-catching ornaments. They are commonly installed behind the kitchen sink, making it easy to keep those plants watered. Bay windows comprise three or more adjacent windows of various styles. These windows connect at angles, creating a panoramic view. Custom window seats are often made to accompany bay windows, making them ideal for reading nooks. Bow windows comprise three or more adjacent windows of various styles. While bay windows connect at angles, bow windows form a round, half circle. They’re great for creating built-in kitchen banquettes, cozy sitting areas, and more. Ideal for distinctive homes with unique architecture or small rooms where standard windows simply won’t do, specialty windows come in all kinds of shapes and sizes to suit specific needs and artistic visions.